When you’re driving, road food often means fast food. It’s tempting to grab a bite at a burger-and-fries joint near the gas pump. Instead, pack healthy car snacks. Visit the Shopper’s Guide to Pesticides in ProduceTM and load up your cooler with fresh pineapple, mangoes, kiwi, honeydew and cantaloupe. Buy organic strawberries, grapes and cherries. Avoid the worst processed foods, and use EWG’s Food Scores to find the healthiest options for peanut butter, nuts, Greek yogurt and protein bars. Remember, less is more – the lower the score, the better. Tips for Kids: Skip single-serving packaged foods. Instead, pack tasty, wholesome choices such as carrot sticks and organic yogurt in reusable containers. If you stop at a fast-casual restaurant, pick one that make kids’ health a priority. You’ll need your sun safety toolkit if you plan to spend hours outdoors at the beach, poolside or hiking during summer’s last hurrah. Plan your day around the sun. Go outdoors in the early morning or late afternoon when the sun is lower in the sky. As a rule of thumb, limit your time in the sun between 10 a.m. and 4 p.m., when ultraviolet radiation peaks – and seek shade whenever possible. Wear sunglasses, shirts, pants and hats to shield your eyes and skin from the sun’s harmful ultraviolet rays. And remember – no matter what the SPF on the label says – slather on sunscreen at least every two hours. Use EWG’s Guide to Sunscreens to find the best beach and sport sunscreens. If you’re planning to wear sunscreen and insect repellent, apply the sunscreen first. Even though summer is coming to an end, Zika and West Nile viruses carried by mosquitoes are spreading. Mosquitoes can bite at any time of day and are usually active until the first frost. What’s the best way to keep bugs from biting? If you’re traveling this weekend, choose accommodations with good screened-in windows and doors so bugs stay outside. When outdoors, protect against mosquito bites by moving away from pools of standing water in buckets, wheelbarrows, plant pots, tires, birdbaths and empty trash cans. If you can, empty and scrub these containers, then turn them over or cover them. Keep skin covered with light-colored long-sleeve shirts, pants, socks and shoes to ward off mosquitos and ticks, which can carry Lyme disease. Frequent tick checks are important, especially after you’ve walked through tall grass, shrubs and overgrown trails. Ticks can vary in size, so use your fingertips to check for unusual bumps. Pay close attention to your hair, neck, armpits, waistband and the backs of your knees. Use insect repellents. Look for products with a 10 to 30 percent concentration of DEET, 10 to 20 percent concentration of Picaridin, or 20 percent concentration of IR 3535. These active ingredients are found in common bug repellents. The concentration determines how long the repellent will likely be effective. The lower concentrations should be adequate for two to four hours outdoors. 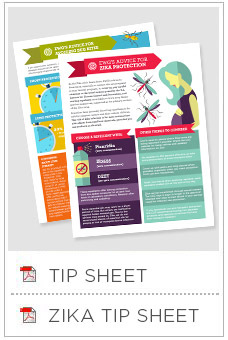 The EWG Guide to Bug Repellents in the Age of Zika provides useful tips and our top recommendations. Follow manufacturers’ directions on labels – products vary in recommended amounts for use and how often to reapply. And always wash clothes and repellent-soaked skin at the end of the day. Tips for Kids: Take extra care with kids. Keep repellents away from young children to reduce the risk of accidental swallowing. Don’t use bug repellent on infants younger than six months old. Instead, cover strollers and baby carriers with fine netting. On the go? Look for ingredient information on food and sunscreens using EWG’s Healthy Living app. EWG does the research for you. Search for ratings on more than 120,000 food and personal care products. No matter how you plan to celebrate, a little caution and planning will keep your loved ones safe and well this weekend.